So I'm fasting for lent. Juice and soup only from now until Easter. I started on Ash Wednesday and have discovered that I really enjoy making my own soups over the stuff out of a can. Does anyone have any favorite recipes they want to share? I got 4-5 good ones, but I feel like I'm going to get bored with such a small selection, and every time I look at recipes online I get overwhelmed. You will find lots of chowder recipes in Yankee magazine's website - most are the same with the only difference being which type of sea food you use. When I make mine, I use pickled herring soaked in sour cream, chopped onions, & cooking wine. Then, I top it off with grated parsnips. Mmm, mmm ~ very tasty! Buy an immersion blender for super easy and less messy blended soup making. I love love this one from Smitten Kitchen (search the archives for more recipes--all of hers that I have tried have been great). Next time I make it, I might add some corn, though, for a little sweetness but make a huge pot, freeze portions and eat this several times a week. "This is a thick, rich soup with tons of flavor. Something I whipped up off the top of my head, with things I had on hand. Super easy, quick, and a great way to use squash. An instant hit at my house." For the veggies, you can partially cook them in the stove first for less chopping, or cut them into smaller chunks and just simmer until tender. The amount of each vegetable varies by what I've got in the kitchen. saute onions in oil until soft. Add remaining ingredients and add broth to top of vegetables. Simmer until soft and blend (this is where an immersion blender helps). Garnish with sour cream or creme fraiche or serve alone. Thanks guys so much! I'm a big fan of the squash so I think I'll try the butternut recipie(s) this week. I'll let you know how I fare. Do they have to be purees? Are you only doing liquid foods? No they don't have to be purees. I'm trying to do mostly liquids, but didn't want to go too extreme since I've got to do it for 40+ days. I am however cutting out pretty much everything else (caffine, refined sugar, bread, etc) so no crackers with my soups. Breakfast is the most difficult. I usually end up juicing followed by a cup of tea an hour later. If I find myself getting hungry I'll have water, juice or tea. And then I eat three meals (lunch, supper and dinner) over the course of the afternoon/evening rather than the normal two. Hale and Hearty is my go to place in the middle of the day if I don't bring in lunch, and I usually make a huge pot of something at home for the evening. The biggest thing is that I find I have a huge sugar craving in the evening which I usually solve with an fresh blended juice. I've been buying plenty of fruit, slice a bunch and throw it in the blender and I'm good to go. All in all its actually been fairly managable. What about chicken or lentils or beef (as in chili)? I have a super tasty spicy chicken soup recipe. Also, depending on where you live, you could pick up some Soup Bowl soups when you're in a bind. I love their stuff and get ideas from their combos, but sadly the Park Place closes at the end of the month to get ready for ice cream season. I like their soups way better than H&H. They have one that seems to be just sweet potato and spinach (and broth) that is delicious. I've had a soup at a restaurant that tasted like this recipe, which I plan to try soon. The one I had also had some potato in it. It was a really hearty tasting soup. I'm doing all three, but not chili. I did a great oxtail and barley soup on Sunday, which ended up thickening almost to a stew. I've been adding additional stock when I reheat to take it back to a soupier consistency. My thought has been a two to three weeks of any soups, transitioning into more single vegetable purees and clear broths around day 20 for 10 days then back to more complex soups for the last ten or so days. I'm going to save the chili for closer to the end when I start getting ready to transition back to regular food. Soup Bowl is a great idea for the weekends, I hadn't even throught about them. That roasted poblano sound fabulous, so I'll add that to the list to make this weekend. I make this Chickpea and Tahini soup on cold evenings. 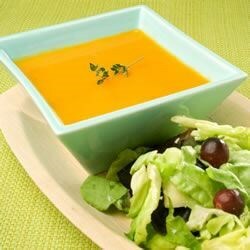 It uses a stick blender which I've found is key to easy soups using almost any vegetable. If you don't have a blender, mung bean soup is also a good and healthy option. Good luck!